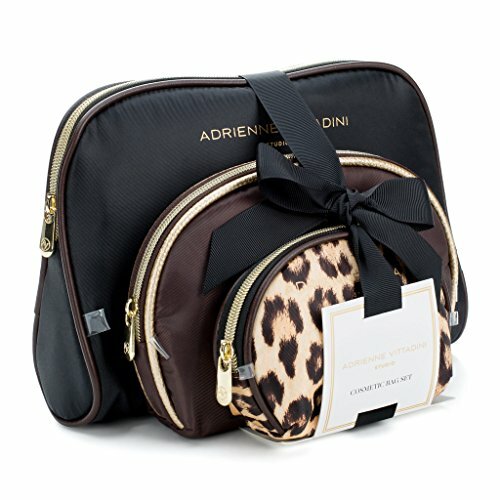 Adrienne Vittadini's 3-piece modern designer makeup or toiletries bag sets provide a different sized pouch for all of your on-the-go carrying beauty needs for organized traveling. Large case measures 10 inches wide x 7.5 inches high x 2.5 inches deep; medium case measures 8 inches wide x 5.25 inches high x 1.5 inches deep; small case measures at 5.5 inches wide x 4 inches high x 2 inches deep. Each high quality luxury holder case is made with waterproof nylon so you can easily clean off makeup or lotion spills by wiping or rinsing the bag. The sturdy PVC trim makes this a durable and light handheld bundle that is perfect as a carry on for any bathroom accessories when traveling or on the go. This cute combo makeup bag set is ideal for organization on the go and can be used again and again in your purse or suitcase. The pack includes a bag big enough to hold large makeup brushes and one little enough for small, delicate items like jewelry or tiny medicine packs. The unique gold zipper on each bag is made of heavy-duty metal for secure closure when traveling or bouncing around in your purse or luggage. Ladies will love the rounded, dome-like tops for flexibility and easy storage inside luggage, a purse or a work bag. Adrienne Vittadini's womens cosmetic bag sets come in several colorful designs and make a great gift set for the fashionable female in your life. This studio set has a black and brown leopard print on the small bag, a plain brown medium bag, and a plain black large bag for ultimate coordinating organizers. If you have any questions about this product by ADRIENNE VITTADINI, contact us by completing and submitting the form below. If you are looking for a specif part number, please include it with your message.